Bonnet macaque in Manegaon, Maharashtra, Indie. 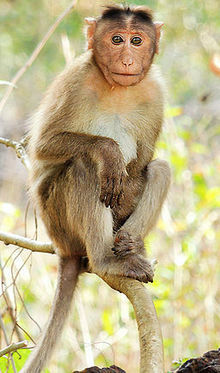 The macaques constitute a genus (Macaca) o Auld Warld puggies o the subfaimily Cercopithecinae. ↑ Groves, C. P. (2005). Wilson, D. E.; Reeder, D. M, eds. Mammal Species of the World (3rd ed.). Baltimore: Johns Hopkins University Press. pp. 161–165. OCLC 62265494. ISBN 0-801-88221-4. This page wis last eeditit on 15 October 2017, at 01:59.